Puerto Calero, Spain also referred to in yacht charter circuits as Costa Calero, is considered as a quaint and laidback holiday resort in Lanzarote. Puerto Calero is a holiday resort enclave along the Lanzarote coast that was developed by Jose Calero. It is famous for its exhilarating views of the local landscape. Many consider the town’s harbour as one of the best not only in Spain but the whole of the Mediterranean and accordingly the area sees its fair share of luxury superyachts and charter yacht rental vacations. Puerto Calero lies on the central portion of the Lanzarote coast and is just 7 miles off the Lanzarote Airport. Arrecife, the island’s capital, is some 16 miles away from the town of Puerto Calero. It is an important destination for seasoned sailors as its marina is amply protected from north easterly winds that prevail in the island. This quintessential yacht charter resort is the new kid on the block, having gone on full operation only in 1989. Still, Puerto Calero was able to make an indelible mark on the tourist map in just a short period of time. Today, some of the best luxury yachts and superyachts are normally moored in Puerto Calero during the most parts of the year. Everything about Puerto Calero is related or attached to yachting, and it is considered as the hub of sailing activities for the island of Lanzarote. It offers unmatched sailing options for yacht charter enthusiasts who are exploring important and popular attractions within the region. With its ideal location and impressive landscape, Puerto Calero is an experience you will definitely cherish for a lifetime. Aside from being an alluring tourist destination, Puerto Calero is also in close proximity to the nearest airport terminal – Arrecife Airport. This airport terminal is just about 10 kilometres from the municipality. Mainstream tourists travel to this holiday resort by air as this airport serves airlines coming from various Spanish cities as well as from major European cities. Of course, the best way to travel to Puerto Calero is by ferry or charter yacht. Seasoned sailors and yacht charter enthusiasts usually access this tourist destination from the islands of Balearic from ports of origins like San Cruz de Tenerife and Las Palmas as well as from Cadiz on mainland Spain. 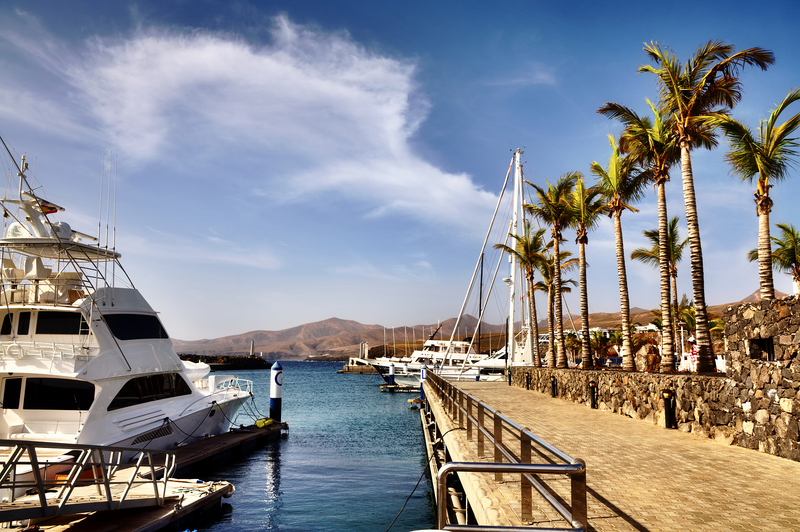 The appeal of Puerto Calero goes beyond its marina, and there is an array of restaurants and other food venues, bars and cafes that line its waterfront. This is one of the best places to observe the goings-on in this idyllic holiday resort. Seasoned sailors and returning tourists consider Puerto Calero as the most beautiful yacht charter destination in the Island of Lanzarote. Since, it is generally a “new” or “young” tourist centre, Puerto Calero does not have anything historical to offer. This young city offers something that is distinctive and its feel and character is something that you won’t find in other luxury yacht charter destination in the Mediterranean. The most important attractions of Puerto Calero are the yachting activities along the coast and around the island of Lanzarote.